This campaign is not only looking for the classic medical history narrative, but is also open to other points of view: artistic, ecological and cultural. In this way, we hope to capture stories based on evidence, research, popular beliefs and even poetry. We hope that this will serve as basis for scientific development as well as a means to create a more harmonious environment. 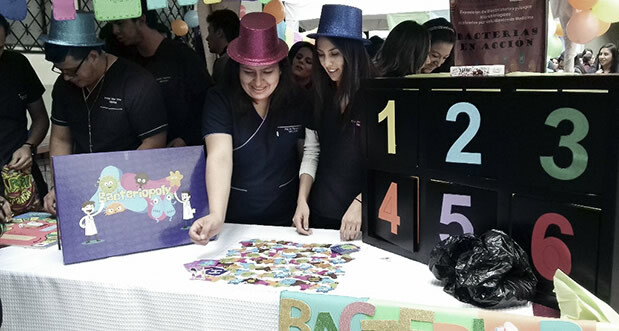 At a conference earlier this year, more than 200 students of the Academic Unit of Health and Wellbeing at the Catholic University of Cuenca, brought new perspectives to the campaign Tell Our Bac-Stories. Through illustration, graphic design and audiovisual material, third and fourth year medical students created stories about antibiotic resistance, Sumak Kawsay and health. Characters like Daniela, a girl with a urinary tract infection, Lucrecia the Bacteria, or Pablito, a comic book hero, raised awareness through informative dialogues and educational material. “the heart and soul of the work belongs to the students, who in a two-month process, freely chose the way that the messages were delivered”. This call is a regional open call to college students and lecturers, social organizations, communicators, journalists, artists, environmental activists, health care workers and general public. Your story can be created individually or collectively, and the format can be anything from an oral or written narrative to an audiovisual approach. Selected stories will be available on different digital platforms and might be used as educational, artistic and cultural material. In addition, two winners will be selected to present at the Continental Encounter: Mother Earth, One Health, in Rosario, Argentina June 12-16, 2017. Deadline to submit is Sunday, April 30th, 2017.